Though examples of global campaigns being “localized” are plenty, none in recent memory have gone as viral in India as the Old Spice Mantastic campaign. Creating another version of ‘The Man Your Man Could Smell Like’ was a lofty aim to begin with, given that Isaiah Mustafa’s portrayal has gone down in history as a near-perfect viral video case study. The personalisation, engagement, influencer identification, concept, script, humour, Isaiah – almost every aspect has been raved about. 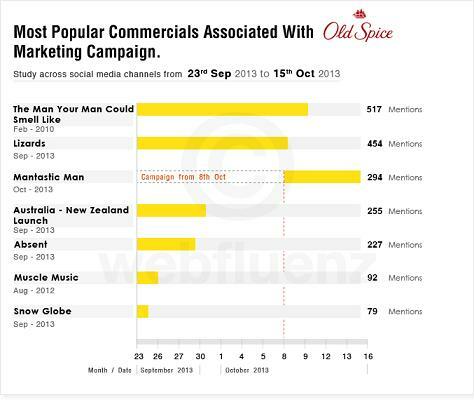 Not to mention Webfluenz’s recent analysis of conversations around Old Spice which showed that it was still being talked about, even after three whole years have passed since it was launched! The Indian campaign starring Milind Soman attracted significant attention too, with millions of people watching the videos. But it really makes one wonder – how many people are actually talking about the campaign? What did they think? Would they still share it a week, month, or a year down the line? When the last Mantastic ad was released in the beginning of November, Webfluenz kept a track of the social media buzz around the campaign all through the month to see how things played out. Take a look. Have a solid consumer engagement plan – it is essential for establishing brand recall. Creating ‘awareness’ is not enough; to be remembered, a campaign needs to compel people to talk about it. Integrate your online and offline marketing, for the simple reason that they always affect one another. You can easily use this fact to your advantage – don’t miss out. Humour is highly subjective, so think through the content thoroughly before implementing it. While advantages of paid promotions are undeniable, you don’t want to get on social media’s bad side. Space out your promotions and updates over time – too much of anything is never good. Pick your brand ambassador with care; be conscious of the advantages and disadvantages of picking him / her. Have a plan on how to handle criticism and exemplify finer traits. Tell us your opinion about this one. Was it ‘Mantastic’ enough for you? What would you have done differently? Bangalore Is All Set To Go Social with Social Media Week!